Dr. Lucien Howe 520 Delaware Avenue, Near Allen St. Buffalo, N.Y. Hours 9 to 1 Buffalo, N.Y., July 19, 1918. Mr. H. H. Laughlin, Eugenics Record Office, Cold Spring Harbor, L.I. 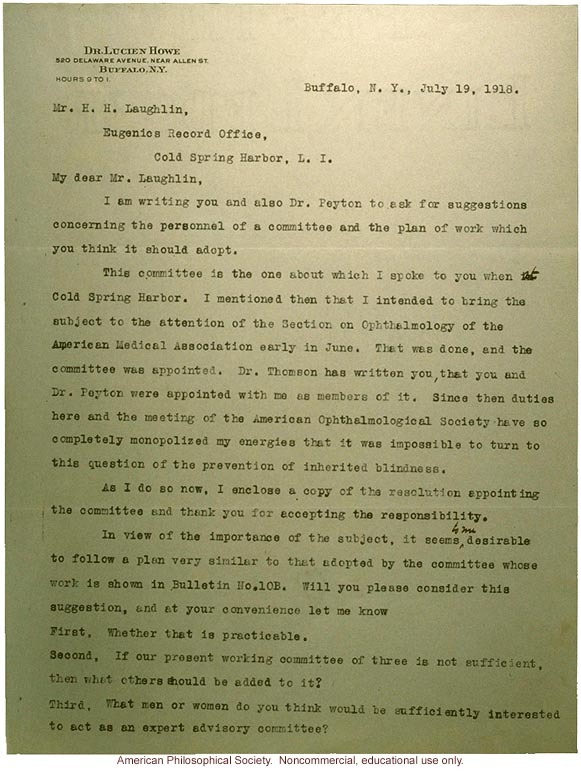 My dear Mr. Laughlin, I am writing you and also Dr. Peyton to ask for suggestions concerning the personnel of a committee and the plan of work which you think it should adopt. The committee is the one about which I spoke to you when at Cold Spring Harbor. I mentioned then that I intended to bring the subject to the attention of the Section on Ophthalmology of the American Medical Association early in June. That was done, and the committee was appointed. Dr. Thomson has written you, that you and Dr. Peyton were appointed with me as members of it. Since then duties here and the meeting of the American Ophthalmological Society have so completely monopolized my energies that it was impossible to turn to this question of the prevention of inherited blindness. As I do so now, I enclose a copy of the resolution appointing the committee and thank you for accepting the responsibility. In view of the importance of the subject, it seems to me desirable to follow a plan very similar to that adopted by the committee whose work is shown in Bulletin No.10B. Will you please consider this suggestion, and at your convenience let me know First, Whether that is practicable. Second, If our present working committee of three is not sufficient, then what other should be added to it? Third, What men or women do you think would be sufficiently interested to act as an expert advisory committee?